The “green building” movement is affecting every segment of the construction industry, and waterproofing is no exception. 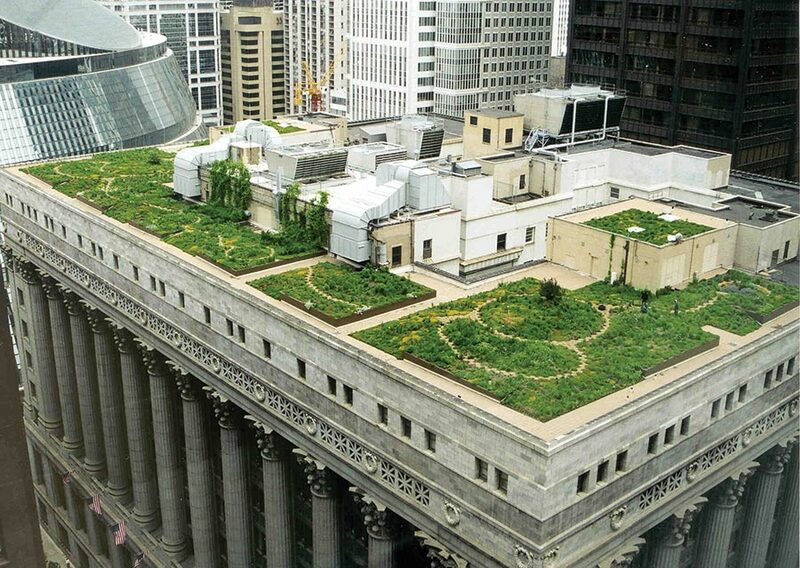 One of the most visible areas affected by the movement is commercial roofing, where rooftops are literally being built green with living plants. Obviously, these “vegetative roofs” present significant challenges to designers and contractors. The weight of the soil, lack of run-off, root penetration issues, and other factors make them more complex than a typical built-up roof. The lack of construction standards also presents a challenge. But contactors and designers who know how to overcome these challenges enjoy a host of opportunities. 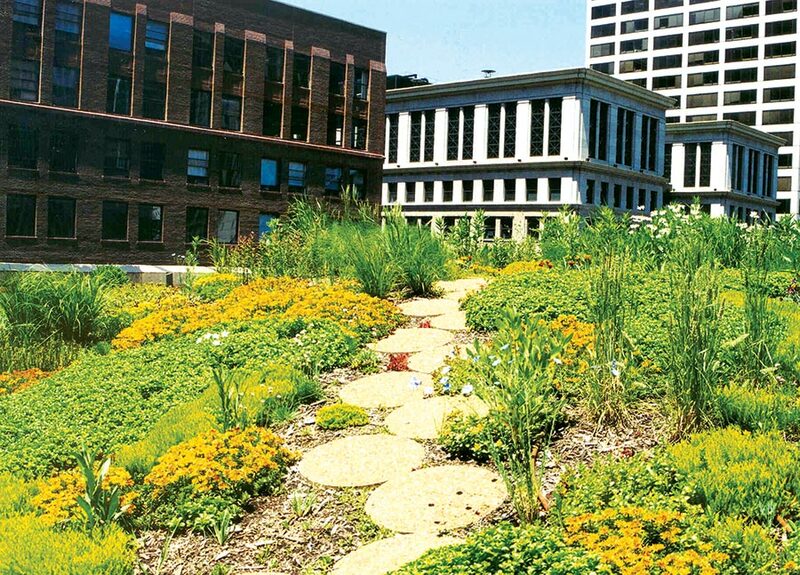 A few states and municipalities offer financial incentives or subsidies specifically for green roofs, and many more offer financial support in conjunction with LEED or other green building programs. Chicago offers the most incentives, and contractors there have installed more 2.5 million sq. ft. of green roofs in the last 10 years. 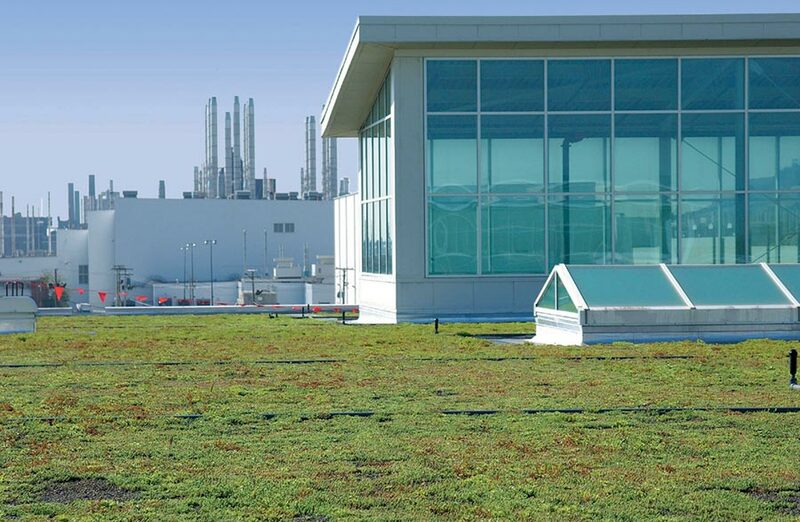 This 10-acre green roof on Ford Motor Company plant is the largest in the world. It also reduced construction costs. This fall, the city rolled out yet another incentive program, offering $100,000 in grant money to install green roofs on residential buildings and schools. Even without government incentives, green roofs have significant advantages, which might explain why they are… (ahem) growing so quickly. According to GreenRoofs.com, the number of green roofs built every year is growing 80% per year. 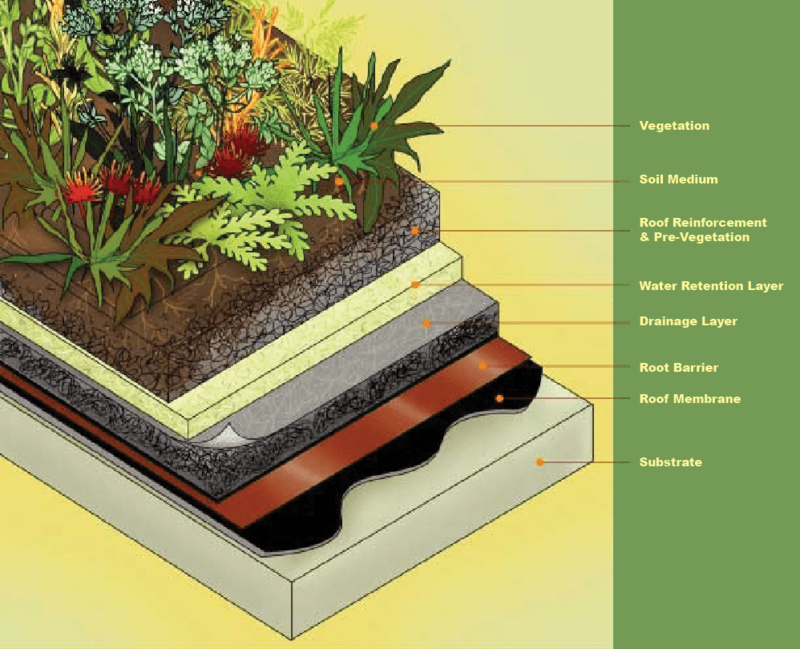 This cross section of a typical green roof shows how the waterproofing, drainage and protection layers work together as a system. While they cost up to twice as much to install as conventional roofs, advocates say green roofs pay for themselves in several ways. Durability: Green roofs typically last longer than conventional ones. A conventional roof might last 20 years, while a green roof will survive 40 to 50 years. That’s because the plants and soil protect the waterproofing from ultraviolet rays and temperature fluctuations that cause cracks. 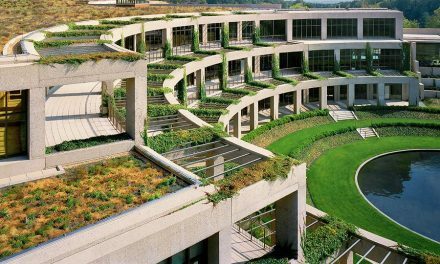 Energy Efficiency and Acoustical Comfort: The soil and plants on a green roof add insulation, increase energy efficiency, and absorb sound. Field studies in Ottawa, Canada, found that a 6-inch-thick green roof reduced heat gains by 95% and heat losses by 26%. The greenery also minimizes the heat island effect of the building. Stormwater Runoff: Another significant benefit is that green roofs reduce stormwater runoff significantly. Ford Motor Company eliminated the need for a $10 million stormwater handling system by installing a green roof on its truck manufacturing plant in Dearborn, Mich. The roof, which covers more than 10 acres, is the largest green roof in the world. 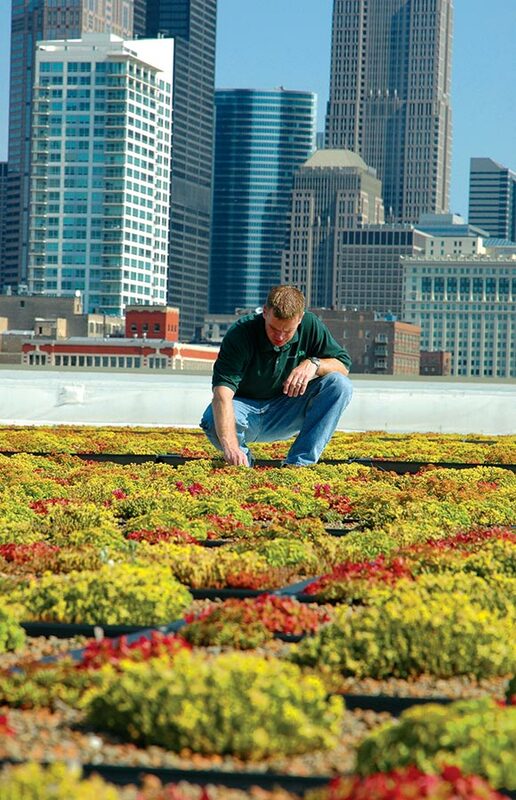 Some green roof systems come ready-to-install with live, growing plants. Carlisle’s Green Grid (see diagram above) is one example, and was used to create the rooftop garden in this photo. Occupant Wellbeing: Studies in Europe show that workers in green offices are happier, more productive, absent less often, and stay with the company longer. The building owners, in turn, are able to charge more for the space. The Fairmount hotel in Vancouver, British Columbia, has a garden roof, and claims guests are willing to pay more for a stay because of it. It also saves them $25,000 a year by providing all the herbs for the hotel restaurant. A green roof is built of at least a haft-dozen components. These include the structural roof (usually concrete), a waterproofing membrane, root barrier, drainage system, filter layer, a lightweight growing medium, and plants. Many designs also include rigid foam insulation and water retention capabilities. Combining several functions into a single product is common. The Atlanta City Hall, for instance, uses J-Drain’s Green Roof System (GRS), which combines drainage, water retention, root barrier and soil filter fabric into a single product. GRS is a 1″ deep, dimpled drainage sheet, faced with a non-woven geotextile that functions as a root barrier and soil filter. Faust notes that even residential projects are starting to incorporate green roofs. The Southeast EcoManor in Atlanta, for instance, has a garden roof over the 3-car garage, easily accessible for the homeowner to enjoy. 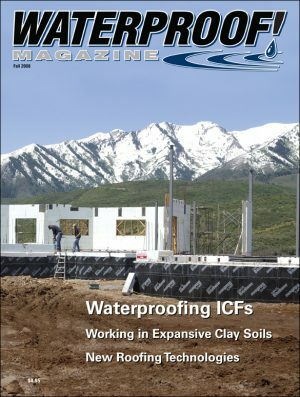 She also says that GRS is compatible with nearly any waterproofing membrane, and that the company offers a variety of other products for any green roof application, based on soil depth, irrigation, and other factors. 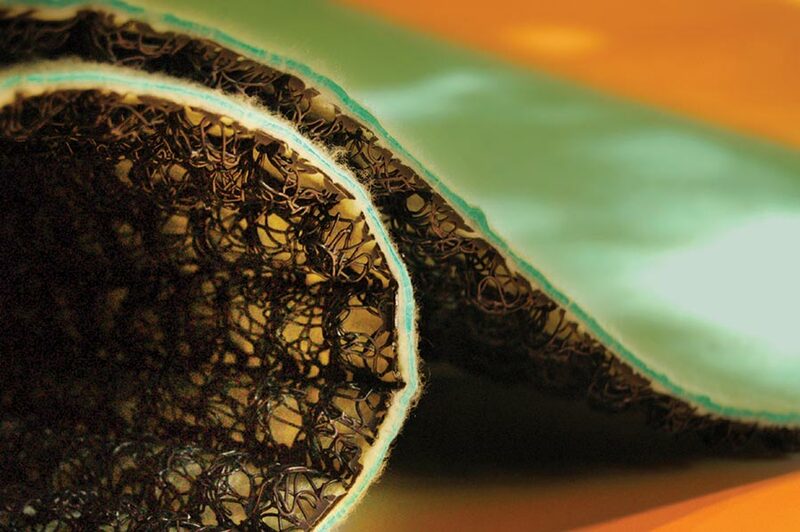 One popular waterproofing membrane for green roofs is American Hydrotech’s 6125. It’s specifically adapted for green roofs, and doesn’t mind pooling water, says Dennis Yanez, marketing director for the company. 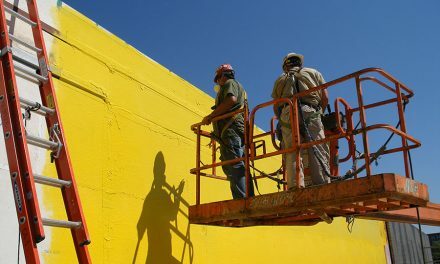 The product comes in cakes, which are melted and applied directly over the concrete substrate with a squeegee. 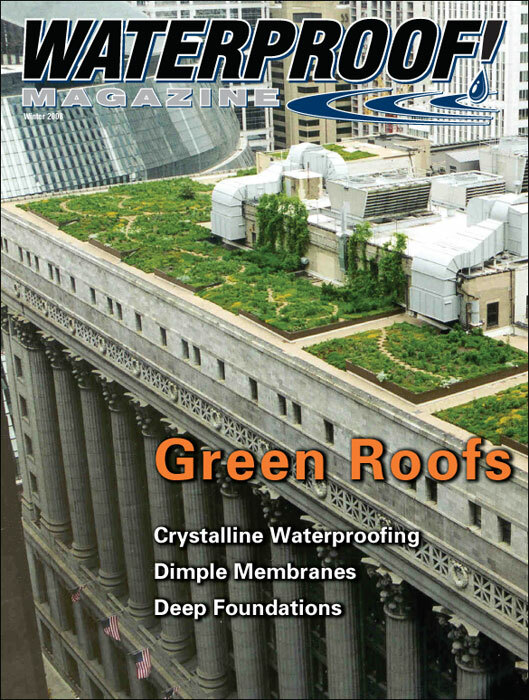 Quality drainage and waterproofing products are crucial for the success of any green roof. 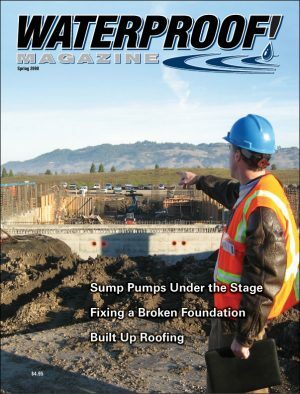 Hydrotech is unique in that it is one of the only companies that can single-source a green roof, from the waterproofing membrane to the soil mix and plants. 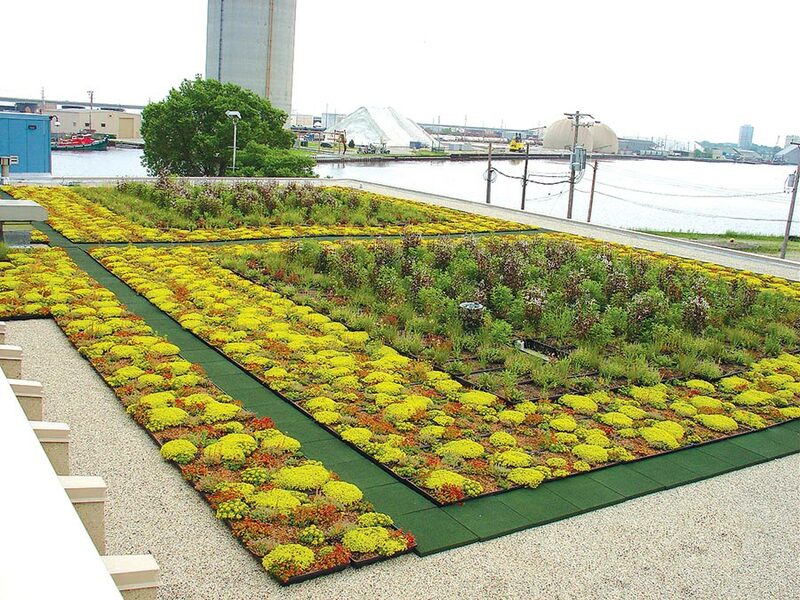 “Owners appreciate a single source warranty for all components in a green roof,” says Yanez. Carlisle Coatings’ 500-R is another option for the waterproofing course. 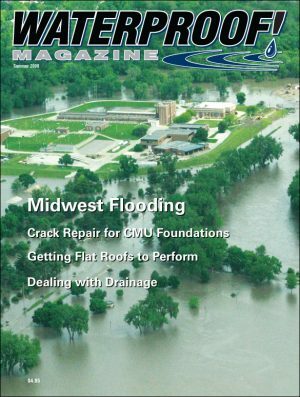 According to Harold Hays, technical services coordinator for the company, Carlisle offers a wide array of waterproofing and drainage products suitable for green roofs, depending on the project’s specifications. Their MiraDrain 9800 series is a typical 3/8” EPS drainboard, with fabric bonded to one face. It adds a layer of insulation, but has no water retention capabilities. Their MiraDrain GR 9200 dimple drain board, on the other hand, is designed for water retention and drainage on green roofs, and the company manufactures moisture mats for additional water retention if needed. Green roofs typically fall into two categories: “Extensive” green roofs, like the one on the Ford plant, have a relatively shallow soil profile (1 to 5 inches) and is planted with low-maintenance, drought-resistant plants. “Intensive” green roofs refer to more substantial plantings with soil 6 inches or deeper, and can accommodate bigger plants. The gardens on top of Chicago City Hall include more than 100 species, organized by bloom color, and includes evergreens and flowering shrubs. For extensive (shallow) systems, one easy installation method is to use Enkaroof VM by Colbond. It can be filled with growing medium and planted off-site. When the plants are established, the flexible matting is rolled up and shipped to the installation location. A non-woven fabric on the bottom of the product holds the soil medium and vegetation in place. Once on the roof, installers simply unroll the mat. Carlisle’s Green Grid is similar. “Our Green Grid system is a green roof that comes in a plastic tray, explains Hays. “It reduces cost, speeds up application, and provides a better warranty than traditional green roof systems.” The trays, measuring two feet square and either four or eight inches deep, are installed directly over the waterproofing layer, and contain all the other components for the green roof, including pre-germinated plants. If any repair work needs to be done, the trays in the affected area can simply be lifted out without disturbing the rest of the roof. Waterproofing and drainage are two major components of green roof systems. The Chicago City Hall roof (above) involves sloping soil, hundreds of varieties of plants, ornamental paver, and other features. It’s visible from more than 30 surrounding buildings. The East Medical Center near Houston Texas, has a 14,500 sq. ft. extensive green roof built with traditional methods. The idea was nearly scrubbed however, when Joe Webb, lead architect on the project, got installation bids of $25 – $35 per sq. ft., instead of the $10- $15 per sq. ft. he’d expected. “We basically had to go back to the drawing board and rethink our whole approach.” Webb says. After evaluating, mixing and matching hundreds of products, they finally found a combination within their budget that was quicker to install as well. These before and after photos show the installation of a 14,500 sq. ft green roof near Houston. Installed cost was between $10-$15 a sq. ft. 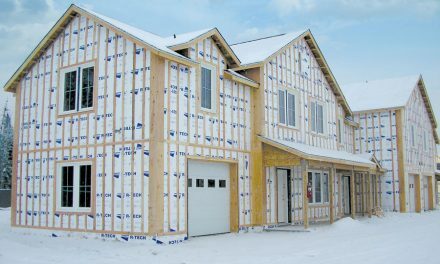 They started with a 4″ layer of rigid foam insulation, topped with a 40-mil. reinforced waterproofing membrane. 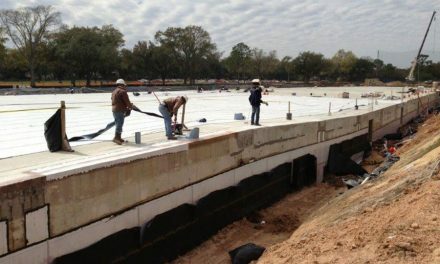 A drain mat was installed on top of the waterproofing membrane, and topped with 9″ of specially designed soil. A key to the roof’s effectiveness is the drainage/water retention composite, EnkaRetain&Drain, manufactured by Colbond Inc. 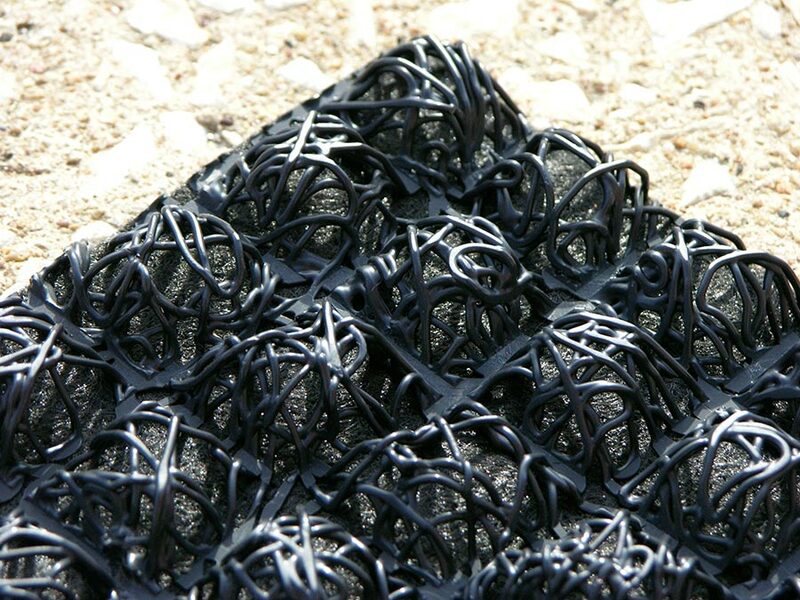 Designed specifically for green roof applications, it is a mesh of tangled polypropylene fibers, with a super-absorbent water retention fabric bonded to one side. Jeff Mickler, president of Jacob White Construction and general contractor for the job, believes they were able to save at least two to three weeks on their schedule, and deliver hefty energy savings as well. The cost savings in mechanical equipment alone was in the neighborhood of $250,000. The environmental impact is equally impressive. Approximately 73% of all rain that falls on the roof is retained to sustain the vegetation growth, while the excess (about 24,000 gallons a month) is reclaimed in an underground cistern and used for everything from irrigating the grounds to flushing the toilets. The building was completed in January 2007. Based on occupancy rates, Jacob White Construction plans to add a second adjacent building in the future. “We want to show the industry, tenants, and the general public that there is a better way to build,” Mickler added. That “better way to build” may change dramatically in the coming months, as the commercial roofing industry codifies green roof construction practices. The move was sparked early last year, when the National Roofing Contractors Association (NRCA) asked the International Building Code to require that green roofs meet the same requirements for wind and fire as other roofing systems. The International Code Council (ICC) unanimously approved the proposal, and some sort of prescriptive method for green roof construction will be adopted into the 2009 International Building Code. “The new standards will undoubtedly change how green roofs are constructed in North America,” writes Kelly Luckett, President of Green Roof Blocks, and a green roof expert. Studies indicate that garden roofs can improve worker health and productivity—even in nearby buildings that only have a view of the greenery. Luckett is part of the Green Roof Coalition, which is drafting the pair of prescriptive standards dealing with wind uplift and flammability. “The current form of the standards includes some new restrictions based on accepted roofing practice and common sense,” he says. According to Luckett, the new standards will meet ANSI requirements, and will be submitted to the ICC at their February 2008 meeting. If this happens, they will be part of the new building code published in 2009. In the meantime, the NRCA, which brought the issue to a head a year or so ago, has published their own manual. 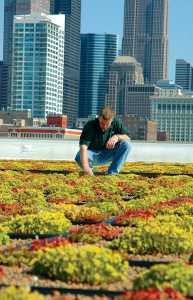 Green Roof Systems Manual—2007 provides in-depth, focused information on the waterproofing aspects of green roof systems. NRCA defines a green roof system as plantings or landscaping installed above a waterproofed substrate that has a man-made structure beneath it. The book can be ordered online at www.shop.nrca.net. Whatever form the new standards take, it seems that green roofing is here to stay. Largest (Extensive): Ford Motor Company, Dearborn Michigan. The 10 acres of plants eliminated the need for a $10 million stormwater handling system. Largest (Intensive): LDS Conference Center, Salt Lake City, Utah. Designed to imitate a high desert ecosystem, some areas in this rooftop garden have several feet of planting medium, and support Aspen, Fir, and Pine trees. Most: Chicago. Since the first green roof was installed on City Hall in 2001, installers have built more than 200 green roofs, totaling 2.5 million sq. ft. At least 100 more green roof projects are currently underway.